Celebrate your own personal Mardi Gras with a Cajun Coffee! 1. Combine the coffee and molasses in a saucepan. 2. Heat, stirring, until molasses is dissolved and coffee is very hot (do not allow to boil). 3. Pour 1 tablespoon of rum into each of 6 mugs. 5. 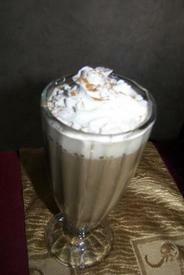 Top with whipped cream and sprinkle with nutmeg. 6. Do not stir before drinking.